Creating a safe, relaxed and inviting environment at the dental office is essential to instilling a positive dental attitude in the child patient. 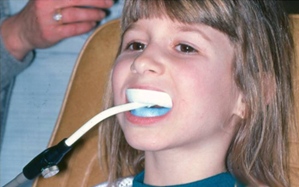 This audiovisual presentation offers non-pharmacological advice and techniques to help make a child's dental treatment an enjoyable experience. Practical tips include word and phrase substitutions which emphasize positive suggestions and elicit positive responses.